Requirements for treatment planning in the mental health and addictions fields are long standing and embedded in the treatment system. However, most clinicians find it a challenge to develop an effective, person-centered treatment plan. Such a plan is required for reimbursement, regulatory, accreditation and managed care purposes. Without a thoughtful assessment and well-written plan, programs and private clinicians are subject to financial penalties, poor licensing/accreditation reviews, less than stellar audits, etc. In addition, research is beginning to demonstrate that a well-developed person-centered care plan can lead to better outcomes for persons served. Provide readers with sample documents, examples of how to write a plan, etc. Mental health, addictions and developmental disabilities clinicians; Social workers; Psychologists; Psychiatrists; Students (pre-degree and post-degree); Psychiatric Nurses; Family therapists; Quality Improvement/Quality Assurance staff; Pastoral counselors; Employee assistance program counselors; Occupational/recreational and other rehabilitation therapists; Utilization review specialists. ""I strongly recommend this book to mental health administrators, supervising clinicians, and others who are concerned with continually improving the quality of their treatment planning process. It would be an outstanding resource for training candidates who are pursuing professional degrees in mental health and addiction treatment."" ""Treatment Planning for Person-Centered Care puts the entire concept of individualized service planning into understandable language for all readers, whether they are students, clinicians or the persons receiving services. The authors have captured the essence of active involvement of the persons served in the identification of needs (as well as strengths) and the development of a plan that will address those needs. This book is definitely in concert with and supports the CARF Behavioral Health standards, and would be an excellent resource for organizations wanting to better understand how to move towards a person-centered assessment and planning process."" -Nikki Migas, M.P.A., Managing Director, Behavioral Health Customer Service Unit, CARF … the Rehabilitation Accreditation Commission. 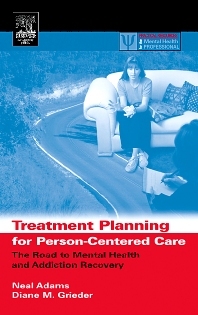 ""Treatment Planning for Person-Centered Care by Neal Adams and Diane Grieder is a one-of-a-kind book. The authors take what for many clinicians is irritating paperwork requirement, treatment planning, that is a diversion from their ""real"" work of therapy and turn it into a valuable tool. More importantly, clinicians and students in clinical training who read this book will think differently when they are done. By placing the person, the client at the center of planning, Adams and Grieder take the reader step by step through a transforming process. They lead us to re-think whose goals are we trying to achieve in treatment. This book could precipitate many fruitful seminar discussions during clinical training, an antidote to the therapist as authority figure orientation that Adams and Grieder critique. This roadmap could also be an enormously helpful for people and families entering mental health or substance use treatment, teaching them what to expect from truly person-centered care."" ""This book encourages the field to turn a very important corner. It clarifies the goals and the processes that Mental Health and Alcohol/Drug systems presently need to focus on: joining with clients to help them enter/re-enter their communities and successfully exit the treatment systems. This book will help practitioners develop the necessary conceptual overview as well as individual components of service plans that will significantly enhance our clients’ chances for real world success."" ""The appendixes are very useful, outlining care plans in a very specific manner that I would find applicable to clinical care... In fact, I would consider using these appendixes as a template for recovery planning."" ""...[the authors] are to be congratulated on such an excellent practical guide which is thoughtful, informative and so easy to read... an enviably clear writing style."" ""...our Director of Clinical and Rehabilitative Services and her senior managers have created a staff training based largely on [the] book called Treatment Planning for Person-Centered Services... the best book she has ever read on the subject."" -Wendy Gradison, LCSW, CPRP; President and CEO, PRS, Inc.
""Neal Adams and Diane Grieder have compiled what should be considered the definitive work on recovery oriented and person-centered treatment planning.nbsp;nbsp; This book has rich detail on all aspects of treatment planning, and provides chapter after chapter of useful and practical information about how to develop treatment plans for people with complex issues in a partnership, and to translate those plans into documentation that is meaningful for both clinicians and clients, as well as appropriate for meeting funding documentation requirements.nbsp; However, an important word of warning:nbsp; if you are seeking a book that provides mechanical check lists to create ""treatment planning made simple"", then this book is NOT for you. Adams and Greider challenge the readers to understand treatment planning as a valuable clinical activity and inspire us not to settle for treatment plans that are just meaningless pieces of paper. This book should be in the library of every behavioral health organization and made available to anyone writing or reviewing treatment plans."" ""Adams and Grieder’s Treatment Planning for Person Centered Care has its foundations in evidence and good clinical judgment. It is recovery oriented, reflecting person-centered values coupled with practical guidance. Clinicians and administrators would do well to build on the foundations of this excellent book. We use it in our work on training and implementing Evidence-Based Practices in the Public Mental Health System in Maryland. We have found that this strengths-based approach ensures the consumer voice is central to treatment planning. It also balances program and provider needs to meet medical necessity criteria and other requirements for payment of service."" ""Treatment Planning for Person-Centered Care by Neal Adams and Diane Grieder is much more than its title implies, and will be a tremendous resource for systems that have begun a transformation process, or any clinician interested in providing recovery oriented care. Their vision for the role of treatment planning in the clinical process is clearly articulated and well organized. They argue convincingly that the ""plan"" needs to be the central concept in delivery of services, and that a well developed plan is actually a clinical tool that advances the recovery process. They are adept at providing enlightening examples contrasting traditional approaches with person centered planning. Most remarkably, they have written a book that is accessible to diverse constituents. This book will be just as useful as a guide for someone who is receiving services and their significant others, as it is for systems administrators and seasoned clinicians. It’s hard to imagine a more practical, comprehensive, or engaging work on this topic, and now there is no need for one. I highly recommend this book to anyone who is interested in helping others find solutions to their lives’ challenges."" Deputy Director, California Institute for Mental Health; Past President, American College of Mental Health Administration, Soquel, California, U.S.A.
Diane Grieder is the owner of AliPar, Inc., a behavioral health consulting firm committed to improving organizational performance, and co-author of Treatment Planning for Person-Centered Care: The Road to Mental Health and Addiction Recovery, a textbook with Elsevier/Academic Press with Neal Adams MD, published in late 2004. She is also a co-author with Dr Adams of a chapter in the Handbook of Community Psychiatry, “Collaborative Person-Centered Planning”, published by Springer in 2012. Diane is also a consultant with the National Council of Behavioral Healthcare and with NASMHPD. AliPar, Inc. was awarded a SAMHSA small business grant to create four person and family centered training guides to be disseminated by SAMHSA. Her work with SAMHSA also includes planning and presenting at SAMHSA’s Consensus Conference on Person and Family Centered Planning. AliPar provides training and technical assistance across the country to whole state systems, psychiatric hospitals, and community behavioral health programs. Diane is also a regular presenter at national conferences such as USPRA, NCCBH, CARF, NYAPRS, and NASMHPD. In May 2012 she presented with Dr Adams at the 5th Geneva Conference on Person-Centered Medicine in Switzerland. Diane has an extensive background working as a QI Director and Clinical Director/Program Manager in the behavioral health field at local outpatient and residential community settings (both private for profit and non-profit) in New Jersey and Virginia She was an accreditation surveyor with CARF for more than 17 years, and has conducted at least 100 accreditation surveys, served on several CARF National Advisory Committees to develop and revise standards, and provided training at four CARF International Conferences on Behavioral Health. From January 1999 to May 2000, she was selected by CARF to assume the role of project director for the CSAT Methadone/LAAM Accreditation Demonstration Project. Areas of Expertise: performs clinical audits and medical records review; develops curriculum and delivers training and technical assistance on person-centered treatment planning; in-depth knowledge about CARF accreditation and co-occurring and substance abuse disorders; advises about creating quality improvement systems, operational efficiency and effectiveness. President, AliPar, Inc., Suffolk, Virginia, U.S.A.